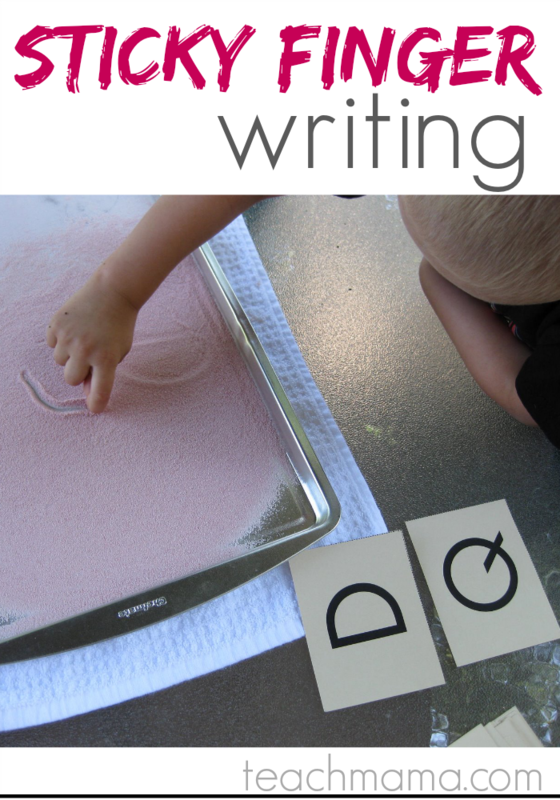 There are a million, trillion cool ways of getting little ones to practice letter writing and to commit sight words to memory. It’s so awesome that I’m able to use just some of these techniques on Maddy and Owen now–at 5 and almost 4 years old, they’re at a perfect age for it. Today, since it was gorgeous outside, we used one method that it seems all little emergent readers love: Jell-O writing. Jell-O Writing (or sticky finger writing: writing letters and sight words): After I put Cora down for her nap, I told Maddy and Owen to grab a chair outside at the table and to wait for me. I said, Today we’re going to practice our word and letter writing–but we’re going to do it in one of the sweetest ways I know. Who’s in? They threw on their Crocs and ran outside. Like their mom, they’re suckers for anything sweet. 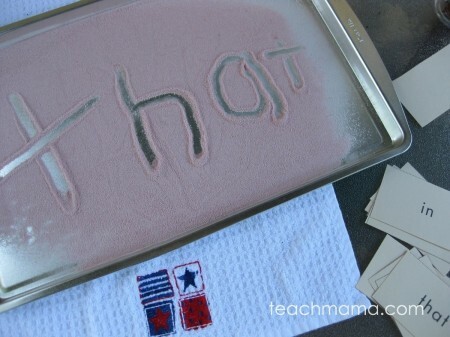 I grabbed the “nice” tray I use for magnetic letters, and I dumped a cheap package of red Jell-O mix on it. I picked up the bag I have of the Dolche 1st half sight word cards and the bag of upper- and lowercase letter cards, and I met the kids outside. I said, Okay, friends, you are going to absolutely love this game. It’s one of my favorites. I have a pile of cards for Owen that has uppercase and lowercase letters because he’s working hard to learn and write these. Here is a pile of cards for Maddy. Maddy’s cards have super-special words on them that she’ll use to read and write in Kindergarten. Here’s how we play this game–I’m going to flip over two cards for Owen. Here’s a ‘D’ and a ‘Q’. Owen gets to choose which letter he wants to write, but today he’s not using a pen or a marker. He’s going to use his finger to write the letter on the tray. I said, Awesome! Maddy, your turn. I’m going to flip two cards for you. The words are ‘the’ and ‘she’. Which word do you want to write? 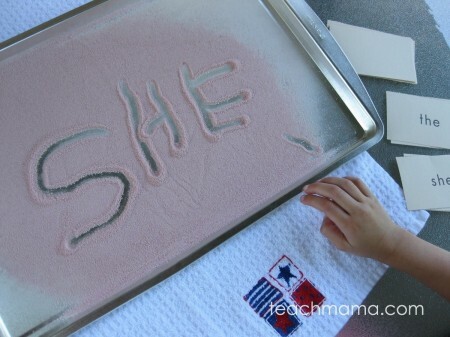 She chose ‘she’ and wrote it in uppercase letters, which I found interesting, since the word was written in lowercase. We flipped and wrote a bunch of times, and each time more and more of their fingers were covered in red Jell-O mix, but what the hay, they were having fun. And it’s summertime. As we went on, I did mix it up a bit: I had them read the flipped letters (Owen) and words (Maddy); they wrote both letters or words; they chose letters or words for each other. 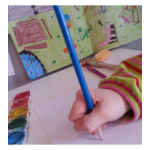 The important part is to give them a choice–forcing them to read or write one particular word at this point can put them on the spot and make them feel like they can’t–if they are unable–and we really want to set them up for success at this point. And that’s our bit of learning for today. The whole shebang took only 10-15 minutes, and I ended the party before they got antsy or bored. That way, tomorrow or later in the week they’ll (maybe!?) ask for sticky finger writing without me trying to shove it on them. . . 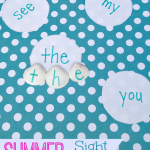 Here is a previous post about sight words that has a bunch of links to sight word flashcards. I use the alphabet cards from reading a-z, but here are some alphabet card download sites: alphabet flashcards, fancier ones from first-school, basic letter cards that may help with printing, huge letter flashcards from the International Parenting Association. Follow amy mascott @teachmama’s board literacy on Pinterest. I love your new look! I also love this idea. I'm not sure if my kids will like it as much as I do because they HATE sticky fingers but it won't cost much to try. Thanks. cute! 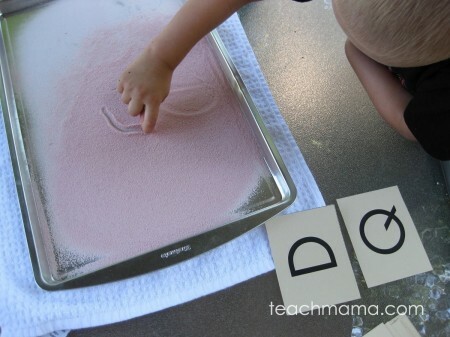 I do a similar activity in my preschool class with salt (cheap!) 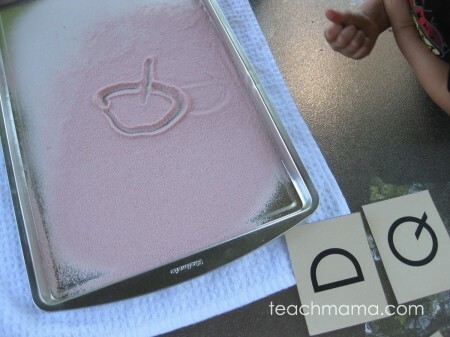 or sand…this would definitely be a great activity to encourage parents to use at home. It sounds like a yummy way to encourage writing. I will definitely try it next summer when Anna is more ready for it. Thanks for a tip! Wow, I love your new blog. It took me awhile to find it. It looks great. Amy, go on over to onepinkfish and snag your blog award. I just love all your posts and always feel encouraged by the comments you leave on my blog. Thanks for becoming one of my favorite bloggie friends. My girls will love this idea! We've been practicing writing numbers in various ways but I have never tried Jello. We'll do it this afternoon! Matthew might go for this one, esp because it tastes good. I like the new header, too. Oh, I really like your new header! I think your point about letting the kiddos have a choice about which word to read/write is great. My rising kindergartener is often intimidated to try because her older sister is an excellent reader. But maybe if I give her a choice between two words she is working on, she would be more willing to give it a shot. Thanks for the pointer! We've done this with flour but jello is so much more fun! Thanks for the idea and the great links. The huge letter cards are just what I was looking for!